some of you may already have noticed that we are planning an assembly next Sunday. Much has happened in the past months and we find it very helpful to create a space where we can all come together to decide on framework conditions that will positively change the situation of the store.… Lass mich weiterlesen! Für die Zeit vom 15. bis 28. Oktober verabschieden wir uns in die Herbstferien. Untätig werden wir jedoch nicht sein, denn in dieser Zeit sollen weitere Arbeiten für die Neueinrichtung und Renovierung des Ladengeschäfts durchgeführt werden. Freiwillige sind jederzeit willkommen. Außerdem: Bis auf weiteres erklärt die Organisation einen Annahmestopp für alle Bücher außer Kinderbücher.… Lass mich weiterlesen! Last Sunday we, the users of the free shop in Bochum, organised our first opening hours in the new shop at Dorstener Straße 37. new and old users made themselves familiar with the new interior with coffee, tea and donated cakes. Actually, we wanted to celebrate our successful move from the Social Centre to our own space a bit bigger.… Lass mich weiterlesen! Everything for free! Soon at Dorstener Straße 37! 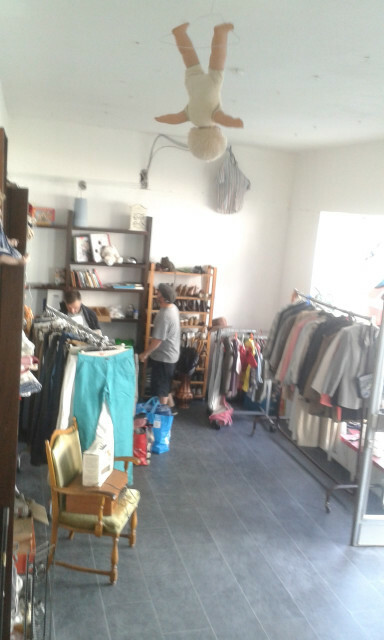 KostNix Freeshop moves from the Social Centre to its own location. From Josephstraße 2 to Dorstener Straße 37. To celebrate the housewarming party as soon as possible, we ask for help with the renovation works. If you can pluck wallpaper, drive garbage to the dump, lay laminate or help to set up the shelves: Please contact us via the known channels.… Lass mich weiterlesen! As you can see, we have created a new info page. For the time being, you only can find the current opening hours here. Nevertheless pay attention to further announcements, e.g. when the KostNix-Freeshop is closed during the holidays.… Lass mich weiterlesen!